Laminated glass consists of two or more layers of glass adhered together with plastic interlayer. At breakage, glass fragments do not scatter, it all remains in one piece until replacement which minimizes the risk of injury. The three sheets pass by the vacuum conveyor or “nip-roller” to empty all the air in between them and bond them together. 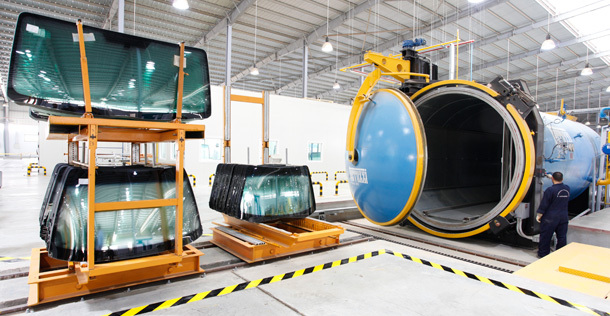 To ensure a strong bonding and bubble free product, the laminated glass is finally put in an air pressure furnace called an “autoclave”. Safety & security laminated glass: with layer multiplication, its penetration resistance increases ultimately becoming anti-burglar and bullet-proof security glass. Heavy duty laminated glass: For hard usage purposes like glass for vehicles, decorative, furniture, stairs, tiles, paths and balustrades and architectural applications. Acoustic laminated glass: two or more layers of glass adhered together with a single or multiple acoustic interlayers that has a better sound reduction performance. Sound performance is further improved if the laminated unit is incorporated in a double or triple glazing product and used in windows and facades. UV blocking laminated glass: UV has a harmful effect on human eyes and skin and is the main cause of color fading in furniture. Clear laminated glass prevents at least 90% to 95% of UV penetration. When using colored or reflective glass in lamination, UV blockage reaches 99.5%. For this reason, it is mainly used in facades, conservatories, and skylights. Decorative laminated glass. Please refer to our decorative glass section for reference. All our laminated products are warranted for 5 years against de-lamination of transparent laminates under normal conditions.